"HIGHLY RECOMMENDED. Berg has written a reassuring, practical book that will help both parents and children lead healthier lives. She analyzes the current data and suggests that, since people come in a variety of shapes and sizes, parents should accept this and embark, along with their children, on a healthy lifestyle that includes exercise and eating a variety of foods in moderation. Berg’s positive, encouraging tone is a refreshing response to more alarmist titles and popular fad diet books that urge people to lose weight immediately via drastic diet changes." HIGHLY RECOMMENDED. Berg has written a reassuring, practical book that will help both parents and children lead healthier lives. She analyzes the current data and suggests that, since people come in a variety of shapes and sizes, parents should accept this and embark, along with their children, on a healthy lifestyle that includes exercise and eating a variety of foods in moderation. … Berg’s positive, encouraging tone is a refreshing response to more alarmist titles and popular fad diet books that urge people to lose weight immediately via drastic diet changes. OFFERS MUCH VALUABLE ADVICE on how parents and communities can address the problem. …What really comes across is that understanding obesity is not easy. Along with the usual suspects, Ms. Berg points to other factors: Bigger babies, excess weight gain in pregnancy, babies semi-starved in the womb by dieting moms, multiple pregnancies for teenage moms, stress, disruption of normal eating, dieting, smoking cessation, medications and even infection. I FOUND UNDERAGE AND OVERWEIGHT TO BE AN EXCELLENT, relevant resource in the very critical issue of weight and children in our society. Of special note is the “ what works; what doesn’t” section. Many of our students are still adolescents and have for most of their lives suffered from weight issues whether they are “overweight” or not. Their well-meaning parents have often been part of the problem. Having a resource that gives such a broad overview of the issues is invaluable. WE NEED TO BE CAREFUL that as we prepare to declare war on obesity, we don't knock down the gains made to combat eating disorders. The focus on poundage sends chills up my spine. Are we quite certain that a focus on weight, rather than on health, is the one we wish to convey to our children? “We need to coordinate obesity efforts with eating disorders prevention,” says Frances Berg, author of Underage and Overweight. “They are interrelated issues, and it’s certainly possible to cause new problems (eating disorders) while trying to fix others (weight gain).” …Our children are particularly vulnerable. UNDERAGE AND OVERWEIGHT IS AN INFORMATIVE, easy-to-read text that provides useful tips for developing healthy habits in children and adolescents while challenging parents, teachers and health professionals to be role models. Berg describes America’s current childhood obesity crisis, identifying potential root causes as well as solutions to the problem while reiterating the “health at any size” message of her previous books. She challenges readers to shift from the traditional, weight-centered model of health to a holistic paradigm that promotes healthy eating, physical activity, and positive self-regard. Throughout the book, vignettes help the reader to understand common experiences, feelings, and challenges of overweight youth. … The book presents a new perspective on how to solve the obesity crisis along with the tools needed to develop wellness in children of all sizes. BERG DOCUMENTS THE CAUSES OF and concerns about childhood obesity in contemporary U.S. society. A dominant and appropriate theme for parents seeking advice is to “normalize” eating behaviors in their children and to encourage more fun exercise opportunities. Berg also provides suggestions for school systems, and points to the possibility of parental behavior generating dangerous eating disorders in children. [THIS BOOK] PROVIDES A COMMON SENSE APPROACH to the weight management problem facing the United States and other developed countries. 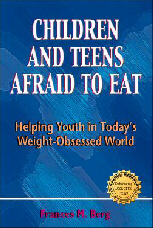 It is a valuable resource for parents of children and adolescents who face challenges with weight management. If parents practice the guidelines outlined for their children, their health may even improve too! The chapter on active living provides the nuts and bolts of starting lifestyle changes. The focus initially should be on consistency, not necessarily duration or intensity. Berg encourages a change to "active living," not just exercising. By making the change to active living, children are empowered to make other changes more easily. Underage & Overweightexamines the scope of the current obesity problem, its root causes, the medical consequences, and the challenges facing overweight children and their parents. It helps put this whole critical issue of weight gain into perspective. Health should be the focus, yet sometimes that is forgotten in the fight to reduce body weight. …The book is well referenced and indexed. Numerous case studies and other examples are given to assist adults in working with overweight children and adults. ADDRESSES THE CAUSES AND CONSEQUENCES of childhood obesity, and presents a 7-step plan for raising healthy-weight children. Underage & Overweight encourages families to promote a more active lifestyle and provide healthier food choices, rather than prescribing diets and exercise regimens, in order to help children and teens develop healthy habits for life. THIS BOOK PROVIDES A HISTORICAL JOURNEY of the evolution of childhood obesity, lets you reminisce over the theories and strategies over the years that have come and gone, then takes you through a thought-provoking analysis of trends and attitudes that prevail today. Berg is one of the nation’s pioneers in the Health at Any Size approach. This approach embraces the notion that beauty, health, and strength come in all sizes and that health is not defined by body weight, but by physical, mental, and social well being. You will learn why dieting is not the answer, and in fact, why it is truly the worst strategy for dealing with excess weight in children. THIS PLAN IS A BREATH OF FRESH AIR, respectful to children, practical for families, and beneficial to communities as a whole. A Call to Action…The chapter “Helping the Overweight Child” is priceless, as it guides parents to honor their already-overweight child with loving methods of interaction, communication, and active play. It includes how to avoid the common pitfalls that tend to make matters worse. I encourage not only parents to read this book, but health professionals as well. There is an urgent need for health-care providers to unite to deliver the same positive and practical messages in order to help our nation’s families. If we all read this book, we could begin to make headway on this vital issue. IT’S THE SECOND HALF OF Underage & Overweight THAT REALLY SHINES. The focus is on what should really count – a child’s overall health and well-being. The wellness approach asks: How can we help the child shift to healthier habits that last a lifetime? How can we prevent weight and eating problems? Berg shares many examples of successful programs already in place and then walks parents through various obstacles to changing the way they think about food and physical activity. Special attention and strategies are given for helping the overweight child build self-esteem and become more active, versus focusing on losing weight or restricting food. Berg reveals why diets don’t work and how repeatedly failing to lose weight and keep it off slides into a downward spiral of negative self-esteem and worsened self-image. A no-win situation for large children and teens living in a culture where obesity appears to be the last socially acceptable form of prejudice. BERG ADVISES PARENTS, TEACHERS, and other caregivers concerned about children’s weight problems to forget about restrictive diets or rigid routines. Instead, they should help their children develop health, confident, diet-free lifestyles in which sound habits for eating and activity come naturally. FINALLY! SOME SANITY IN THE MIDST of the “war on childhood obesity.” Berg argues that the time for admonishing people to “try harder” to lose weight is over; instead, offer an approach that works. Berg has done just that with Underage and Overweight. Berg’s groundbreaking work promises to help move children to healthy, confident, diet-free lifestyles in which sound habits for eating and activity come naturally and the “childhood obesity crisis” is a thing of the past. UNDERAGE AND OVERWEIGHT DEALS WITH THE ROOT CAUSES of obesity and discusses the lure and danger of fad diets and other quick-fix solutions. …Clearly written, using charts, tables, and case examples, the author devises ways to effect lasting change in children and start solving the obesity crisis. ... Covers a range of useful information. THIS BOOK DESCRIBES THE MAGNITUDE of the problem and why the solutions previously tried have not worked. A new perspective is introduced: approaching the problem from a wellness point of view. In this paradigm the necessity of considering the whole child is emphasized. We have to be vigilant regarding intellectual, emotional, spiritual, social and occupational health, as well as physical health. I recommend this book to the person willing to consider an alternative to the solutions that we have tried for the last 50 years without success. BERG SUGGESTS IT'S EASY to start young children off with active habits by incorporating physical activity into their playtime. “The idea is not to have baby workouts,” she advises. “But too many are stuck in the stroller, baby seat, or playpen for long periods.” … It can be a great way to get the grown-up moving, too! WE'RE CONCERNED ABOUT OVERWEIGHT, unfit children because they might already have one or more risk factors for heart disease. They also typically suffer from teasing and ridicule, which can cause stress, anxiety, reduced self-esteem and lower self-confidence. Restrictive diets, diet pills and worse – weight-loss surgery – are potentially harmful and can interfere with a child’s growth and development. So what can we do to safely help children reach a healthy weight? An expert on the subject, Berg emphasizes how important it is for all children to know they are loved unconditionally. If your child is overweight, your home needs to be a safe haven where he or she can feel good about himself or herself and escape harassment. Berg’s book is filled with compassionate, proven tips. THIS BOOK PRESENTS a practical method of intervening in order to address childhood obesity on an individual level. As someone in a busy pediatric practice who has limited time to offer education during the course of a clinic visit, but who sees many children with this problem, I found the overall practical presentation in this book very helpful. There clearly is a need for this approach. BERG SAYS THOSE ASSOCIATED WITH AGRICULTURE should be opposed to fad diets. For instance, the diet craze Atkins nearly eliminates cereals, major products of American agriculture. “While Atkins is heavy on meats, so people are getting a good source of protein and iron, it lets them down with low carbohydrates. Many other plans are overbalanced with cereals, eliminating the meat. These diet plans are just as unhealthy and unbalanced.” And from the agricultural community’s viewpoint, detrimental economically. The trouble is that in the United States, we tend to do things by extremes. Instead of following an extreme diet plan, Berg advocates that youngsters and adults alike use balance, variety and moderation in their eating habits, following the food pyramid. THE TIPS PROVIDED IN UNDERAGE & OVERWEIGHT are intended for anyone working with children. The target audience is not limited to parents or other caregivers, but also for any person who has a direct impact on life of the overweight child (teachers, school administrators, doctors, nurses, and health care workers). The compilation of research and relevant interventions is helpful for future reference as well. THIS IS AN EXCELLENT RESOURCE BOOK .... Comprehensive. Offers practical solutions to a serious problem. CONCERNS ABOUT CHILDREN'S WEIGHT are bookended by obesity on one side and eating disorders such as anorexia and bulimia on the other. "Obesity and eating disorders are part of the same problem," and both are increasing, Berg says. "Sometimes when people are trying to fix one problem, they cause another." Normalizing eating and activity should be a strong focus to helping overweight kids, she writes. Cultural factors such as the widespread substitution of fast food for family meals, "the death of the family dinner," and a jump in sedentary living for children disturbs that normalcy. Berg recommends three goals for parents and kids: Live actively, eat well and feel good about yourself and others. It’s time to take a new approach to wellness and wholeness. Time to focus on promoting healthy, happy lifestyles for our children. This is an urgent challenge for America and countries around the world. The traditional ways of dealing with weight through food restriction and the dieting mentality have not worked, and are causing harm. The new approach asks: How can we help this child shift to healthier habits that last a lifetime? How can we prevent weight and eating problems? How can we help each child be healthier at the size he or she is now? One can hardly pick up a newspaper or turn on the television without hearing the disturbing news that overweight is on the rise – for children as well as adults. And it’s true. The prevalence of overweight has increased sharply since the early 1980s. Solid evidence for the increase comes from the National Health and Nutrition Examination Studies (NHANES), the nation’s most comprehensive look at our health and nutrition. In this series of multiyear studies, beginning in the mid 1960s, large, representative samples of Americans are interviewed, weighed, measured, and clinically tested in mobile clinical centers. What alarms public health officials is that overweight rates for children (that is, children whose weight falls at or above the 95th percentile) have tripled since the 1960s and 1970s, when they had remained fairly stable, at around 5 to 6 percent. Though statistics on the prevalence of overweight in children are staggering, it is important to keep them in perspective — not all kids are at risk. Eighty-five percent and more are not overweight. A few decades ago there was perhaps one large child in a class of 20 – now there are two or three. In areas with low income or high minority populations half of the students may be overweight. If we use current adult rates to project the future for our typical class of 20, six students will become overweight adults and six will be obese adults. Nonetheless, if you go to a school and look around you’ll see that most children and teenagers are quite slender, many girls painfully so. Their body types range from tall and rail thin to short with soft curves, and everything in between. You will see children moving through the many natural stages of pre-puberty, rapid growth, and emerging maturity. The weight of all but that 10 or 12 percent increase has remained steady over the past three decades. And many who are classified as overweight are well-muscled athletes or simply big kids. So it’s important that obesity concerns not dominate others, such as the need for growing children to be fully nourished. In the big picture it is the child’s total wellness that counts. Physical, emotional, and social health are all part of the bigger picture that means children come to school alert and ready to learn. Healthy Weight Kids is a seven-step program for helping children and teens develop and adopt a healthy, confident, diet-free lifestyle in which sound habits come so naturally, they need not think about them. It works for youth of all sizes and ages. With this plan young people on the wrong track can change direction, rediscover active living and normalized eating, and build a strong foundation for a positive health journey through life. As a parent, you can help free them to live in normal, healthy ways, restore life’s balance in body, mind and spirit and move on to what’s really important in their lives. The focus is on four major areas of life: living actively, eating well, feeling good about ourselves, and feeling good about others. The goal is for lasting change that makes a real difference, not quick results. So relax and enjoy the journey with your child. Puberty can be a difficult time for some youngsters. It’s a time of profound body changes, and often weight and fat gain. 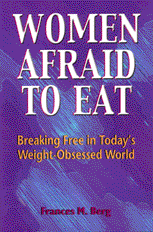 It’s a time of increased risk for eating disorders. Your family can be a powerful force in diffusing the anxieties your child feels about weight and appearance. Keep the lines of communication open. Talk to your child, allowing him or her to share concerns about appearance and weight with you. It is important to take the time to listen without brushing off the concerns. Avoid focusing on weight as a problem. This is likely to bring shame and guilt, and is not helpful to moving forward with long-term behavior change. Moving toward health goals with your child means maximizing the quality time you spend with your child, and minimizing the disappointments and distress the child feels. Instead of encouraging large kids to lose weight or restrict food, it is better to help them build self-esteem and become more active. It may mean spending more time walking and less time sitting. It may mean drinking more water and milk – and less soda. It may mean eating more meals together with family, and spending less time prowling the kitchen for snack foods. For parents of the larger child, consider how to reduce weight gain while height catches up. Resist pressure to put the child on a diet. Parents often feel guilty and responsible. Their guilt is reinforced by others who think parents have “done something wrong,” and expect them to remedy it. Parents need support in pursuing a moderate approach. No criticism. When you define your child’s healthy weight as the natural weight the body adopts, given healthy eating and meaningful levels of physical activity, it helps everyone move on from the destructively narrow definition that labels children in terms of numbers. Parents who want their larger child thin at any cost need to think carefully about what this can mean. Ill-advised weight loss attempts affect the body in profound ways. Potential outcomes range from body hatred to eating disorders, from depression to suicidal intent. Risk of death is a real possibility. Wellness is a way of taking control of one’s life, of living actively, with enthusiasm and pleasure, of enjoying a higher quality of life. Wellness is free, or costs very little, and is enjoyable from the first moment. It improves the quality of life, the richness of life, the simple joy of living well. By choosing a wellness lifestyle, we can prevent much disease and disability, and can cope better with inescapable experiences of illness, disability or trauma. The wellness approach combines sound physical, mental and emotional health in a positive relationship with family and community. It’s helpful to think of wellness as a wheel, to visualize how the six dimensions of wellness complement and interact with each other (see figure 12.2). When one aspect is strong, it strengthens and positively affects the others. Yet all are needed, and a balance of growth in each dimension helps the wheel roll along smoothly. The wellness journey begins in infancy. It’s a journey that parents can enjoy in the moment and look forward to with pleasure. So take her hand and help your child grow and blossom in all six dimensions – physical, intellectual, emotional, social, occupational, and spiritual wellness. Rediscover normalized eating, for yourself and your child. Tune in to hunger and satiety cues, eat to meet energy and nutrient needs, and trust the body to make up for times of eating too much or too little. Discover the joys of living actively, happily discarding the miserly goals of exercise for calorie burn. For people schooled in weight-centered, control thinking, this is a 180-degree shift that profoundly changes not just their thinking, but their knowledge and behavior as well. They become advocates for a lifestyle free of dieting. Feeding Our Kids at School: Who’s in Charge? Available at bookstores everywhere and online from Amazon.com and Barnes & Noble. Distributed by W.W. Norton, 500 5th Ave., New York, NY 10110. (Orders 1-800-233-4830; Customer service 1-800-233-4830; Fax orders 1-800-458-6515). Overweight provides solutions for parents who are concerned about overweight or obesity in their children – or who simply want to learn how to help their children lead healthier, more active lives. It brings together complex research, written in a flowing easy-to-read style, and gives practical guidelines for the whole family, including a 7-step plan for raising healthy weight kids. Invaluable for policy makers, teachers and healthcare providers.